While on my travels training and consulting with early childhood providers, I am often privileged to tour early care and education program sites and have company managers and center directors share with me ideas that work for them. This is a promotion created by Kevin Wilhelm, Director of Marketing for Edleun Education Learning Universe in Canada. 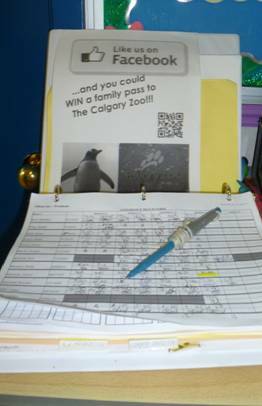 Not only will this engage their customers in a fun contest for tickets to a family activity, it is a good use of social media to cost-efficiently help spread the good word about Edleun’s centres. Putting this notice right beside the sign-out book helps remind parents to check the company’s Facebook page as soon as they get to Internet access, which for some will be right there on their mobile phones!